This is the second in a series of articles on mobility. The Woodlands has many miles of pedestrian paths available for running, walking and cycling. This is one of the most valued amenities enjoyed by a large number of residents and outside persons. A person is able to enjoy the outdoors while going to the grocery store, to a local store, to a friend’s home, or for exercise. Being able to smell the flowers and the trees, to be able to make visual contact with nature is one of the superlatives used to describe the lifestyle here. There are some shortcomings to this amenity. Highways separate our villages from one another. Moving about on foot is not as easy and safe as it should be. Take Gosling and Woodlands Parkway as an example. Try to cross Woodlands Parkway by foot in rush hour. 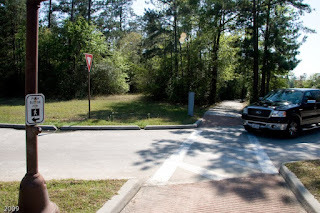 As a person walks down the pathway on Gosling going north, and tries to cross the parkway, a person must first cross the right turn lane to reach the pedestrian switch to request a green light to proceed across the intersection. A vehicle could easily hit someone trying to reach the signal control button. Then the person stands on the island where the control button is located until given permission to cross. Often, so much time passes that a pedestrian becomes frustrated and crosses without permission. All the time spent on the island presents a risk that a driver may come by using his cell phone or being distracted otherwise, and swerve to hit the pedestrian on the island. Another type of pedestrian must cross this intersection. Elderly folks live in a nearby apartment complex and take their electric carts to the grocery store. I hope we never have one injured there. This is not pedestrian friendly engineering design! It is the result of engineering without master planning. What happened to pedestrians’ mobility planning anyway? Now we wait for an expansion to a six-lane highway. I can't imagine what it is going to be like after that is completed! This path is sort of a secret. 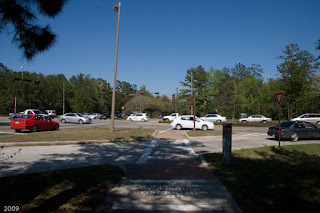 It provides the pedestrian in Panther Creek a means to safely cross under the Woodlands Parkway. This is an example of creativity and was constructed because residents were part of the solution..
Another pedestrian we should consider is the student. Do you know that in the village of Indian Springs, there are no public schools? Spring Creek, Gosling and Woodlands Parkway bound the village; both roads are highways and the one is heavily congested. Soon, there will be six lanes to cross over Woodlands Parkway, instead of four! The children are separated from their schools by these highways. There used to be a speed limit of 35 on Gosling, making it easier for children to ride their bikes to McCullough Junior High or Glen Loch Elementary. Now it suddenly has become 45 MPH that is actually 55 when the normal extra 10 mph is tacked on. Much of the traffic along that stretch consists of drivers from outside of The Woodlands. Of course students have access to and rely on buses to transport them to and from school. Sometimes they miss the bus or it is inconvenient to participate in an extracurricular activity before or after school. One thing for sure - if a parent can avoid travel by foot for the kids, she will find an alternative! A similar issue exists on Research Forest at the high school there, but fortunately the CISD police monitors the traffic during school zone times for obvious reasons. Many of those youngsters cross that road before and after school. Widen that road to six lanes and we will see a higher risk to students crossing Research Forest. It is already risky from cars turning right onto the road over the marked crossing. 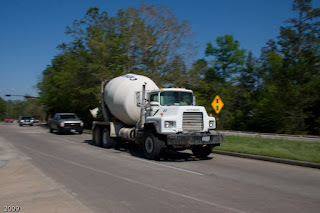 Kuykendahl and Woodlands Parkway has the promise of future issues but today, I am not aware of any significant ones. I do see pedestrians crossing the parkway there. 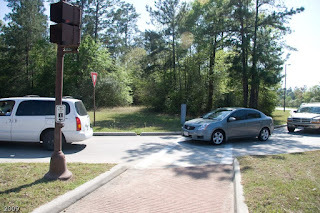 At the Kuykendahl and Flintridge intersection, residents routinely cross Kuykendahl. The traffic load is not very heavy most of the time. We say that our community is pedestrian friendly, but it is generally so only within the confines of a village. I would say the paths are generally pedestrian friendly within the villages in most cases. I've been on many of them. However, the mobility of automobiles has trumped our pedestrian amenities at our highways. I am hoping to see less safety risk on our pathways rather than more risk in the future. Residents need to speak up and not just accept what is provided. Status quo is not acceptable in a growing community. That is like putting our money under the mattress during inflation. We allow value to decrease or at least settle for less than excellence.